Serene beaches, pristine water, beautiful tropical weather and the rich French and British heritage. If these aren't enough to stage your perfect destination wedding keep on reading, because the Seychelles islands have plenty more to offer. Roughly 930 miles off the east coast of mainland Africa and to the Northeast of Madagascar, nestled in the Indian Ocean is the tropical paradise that is the Seychelles islands. Island hopping - Seychelles has 115 islands which means you'll not be short of places to explore while you're there. Day excursions to the islands are organized by several small companies. Islands can be reached via helicopter or ferry. Snorkeling - Don't just stick to the islands, the sea around them is home to an abundance of tropical fish and beautiful coral reefs making it perfect for snorkelling and diving. Turtles and giant sting rays are also common sightings. Hiking Morne Seychellois - Take a hike on Morne Seychellois, the highest peak on the island of Mahe and enjoy the beautiful and unusual flora including the Pitcher Plant, a plant known to be carnivorous. Idyllic Vallee de Mai – Thought by early explorers to be the location of the Garden of Eden, Valle de Mai (May Valley) is home to coco de mer, a palm plant with the largest seed in the world. You will thoroughly enjoy exploring Vallee de Mai’s virtually undisturbed palm forest. Vallee de Mai is a UNESCO World Heritage Site. Giant Tortoises – This almost extinct species is found in only 3 areas of the world: the Seychelles, the Galapagos and the Mascarenes islands. The largest population of giant tortoises is found on the Aldabra Atoll in the Seychelles; about 150,000 individual tortoises are found here. 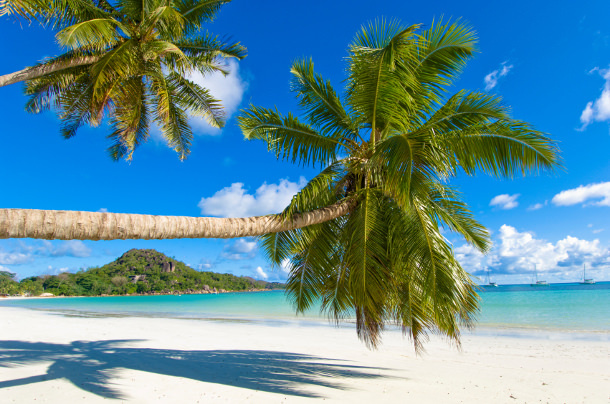 The weather in the Seychelles is tropical and so anytime is a good time to visit; temperatures range between 75⁰F and 86⁰F all year round (24⁰-30⁰ Celsius). Humidity levels reach about 80% but the soft ocean breeze helps to take the edge off. Culture in the Seychelles is as diverse as the number of islands. You'll find individuals of European (mainly French and British), Indian, Chinese and African descent. Life on the islands is relaxed and you can expect warm and friendly faces wherever you go. Seychellois Creole is widely spoken. A 5% to 10% service charge is added to most charges in the Seychelles so tips are typically not expected. However, if you feel you received excellent service, you're more than welcome to leave a tip at restaurants or hotels. Breadfruit and rice are the two carbohydrate staples eaten at most Seychellois meals. Because there's very little local transport, ingredients used in Seychellois meals can always be counted on to be the freshest of the fresh. With the help of our directory you can arrange your wedding on your own or you can employ the services of a wedding planner in the Seychelles. 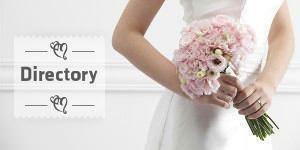 A wedding planner will work with you to plan every detail from start to finish, however this does come at a cost. Depending on what you plan to do, a wedding in the Seychelles will cost you anywhere between 16,000 Seychellois Rupees (approximaterly US $1,330) to upwards of 120,000 Seychellois Rupees (about US $10000). All major credit cards (VISA, MasterCard, American Express and Diners Club) are accepted so you don’t need to worry about converting currency and it should be simple to pay your suppliers. The following notes are not comprehensive and are intended as a guide only. Before planning your wedding in the Seychelles we strongly advise you to contact the Seychelles embassy in your home country or your country's embassy in the Seychelles to obtain up-to-date legal requirements. You don’t have to be from the Seychelles to get married there, but church or religious weddings conducted in the Seychelles are not considered legal unless a civil ceremony has also been conducted. The civil ceremony can take place in your home country or in the Seychelles. If you'd like to have the civil ceremony in the Seychelles you'll need to apply to the Seychelles Civil Status Office in Victoria. To give yourself time to receive documentation from the Seychelles Civil Status Office confirming you've fulfilled the civil ceremony, you'll need to perform the civil ceremony at least two months in advance. You'll also have to advise them of your wedding date 11 days prior to your planned date. For this reason, it's advisable to notify them on the day of the civil ceremony. Documentation indicating any previous name changes needs to be provided to the Civil Status Office in order for a civil ceremony to be conducted. The 115 Seychelles islands can be split into two main groups, the Inner Islands and the Outer Islands. Find out more about the Regions of Seychelles or browse our Seychelles Wedding Directory to start planning your dream wedding.